Share this story on social media! I’m very happy I’m not in school anymore. I graduated a few years ago, but more and more every day I hear about incidents at school. On the news, on the internet, on texts my friends send me, all sorts of horror stories. But the stories online are the ones I’m always finding myself glancing through. I’ve seen stories online of people relating how their school went into lockdown, and the story ends up being about some hobo who had been living under the school, or some crazy person from down the street who finally snapped one day. I don’t know if they’re true, but all I know is, our school went into lockdown once. And I don’t know if even the people at my school know the whole story as to what happened. I don’t even know if I understand it myself. It still seems like some sort of fever dream, something that didn’t happen, couldn’t happen. It was the middle of third period, math. I had just finished a big test (I found out later I had made a bunch of mistakes, and ended up getting a D, but that’s not really important to the story). I used the hall pass to go use the bathroom. Unfortunately, the school bathrooms were all located at the stairwells, and of course, the bathrooms on the first floor, where I was, were closed for repairs. I had to go up to the second floor, but before I got there, the bell rang. The bell never rang during class before, but as it did, an announcement came over the PA. I froze. I could hear sirens approaching. I came out of the stairwell, but already the doors in the hallway were closing, and I could hear them locking. I was alone, and out in the open. I could go into the bathroom now, but the doors had no locks on them since my freshman year; after some juniors trapped a freshman in the bathroom and duct taped him inside a stall, they removed the ability to lock them at all. If there was somebody wandering the school, I’d have no chance if I went into there. I ran down the hall. I could see classrooms turning out their lights and covering the windows. I couldn’t turn to them for help; all the instructions said to not answer the door. I had to find someplace safe nearby, before something happened. I turned a corner, and I saw my chance; the janitor’s closet was open. Lunch was up next period, so he was probably out setting up tables when the announcement was made. He wasn’t in there, and it could easily be locked from the inside, so I jumped in and shut off the light. The only light I saw was from the bottom of the door. I waited, and the sirens grew closer and eventually stopped. Time passed, and I wasn’t sure if I was happy that I couldn’t hear anything going on or tense because I had no idea what was happening. Then I heard footsteps. Lots of them. They stopped in the hallway. It must have been police. I could hear radios and other assorted noises. I didn’t think it could be some sort of lone gunman or nutcase, so I listened. One guy in particular sounded like the one in charge. Another guy answered. I didn’t know what his rank was, but clearly he was not in charge of the first guy. I couldn’t hear much for awhile. There was too much movement, too many people all talking to each other to make out anybody from where I sat. I just waited for a little while. Maybe it would all just be over soon, and I could leave the closet and go back to class. Then, that’s when it all happened. The chief yelled out. The commotion outside stopped abruptly. A moment later, clothes rustled loudly as what sounded like a large number of guns were drawn. It stayed quiet, except for a few of the guns cocking. I thought I would hear shots go off, back and forth, and eventually somebody saying suspect down. What I didn’t expect was the scream. It wasn’t a normal scream. It wasn’t somebody crying out in terror. It was like a wounded animal, mixed with the sound of a band-saw hitting concrete. I’ve never heard anything like it before, and I hope I never hear it again. Then the guns began to fire. The horrible scream happened again, and then other screams, and then the sounds of tearing. I saw the shadows under the door as people moved and fell over, and heard the tell-tale splatter of gore as it soaked the floor. There was another gunshot, and I nearly yelled out myself when a bullet punched through part of the doorway. It wasn’t very big, but I put my eye up against it, and I could see a group of people being attacked by somebody. But something wasn’t right about him. He looked too long in places, like he’d been stretched in a taffy machine. He was moving so fast, though, that I couldn’t make anything out, except for him grabbing people and throwing them around like they were nothing. There was blood everywhere. More gunshots. The scream happened again. And again. I pulled away from the bullet hole and sat back in the closet. Then the scream began to fade. I heard a thud, and then more footsteps. The chief spoke again, but he was breathing heavily, like he had been badly wounded. I didn’t move. I wanted to look again, but as curious as I was, I didn’t really want to see but I heard a lot of commotion for a long time, and then, nothing. 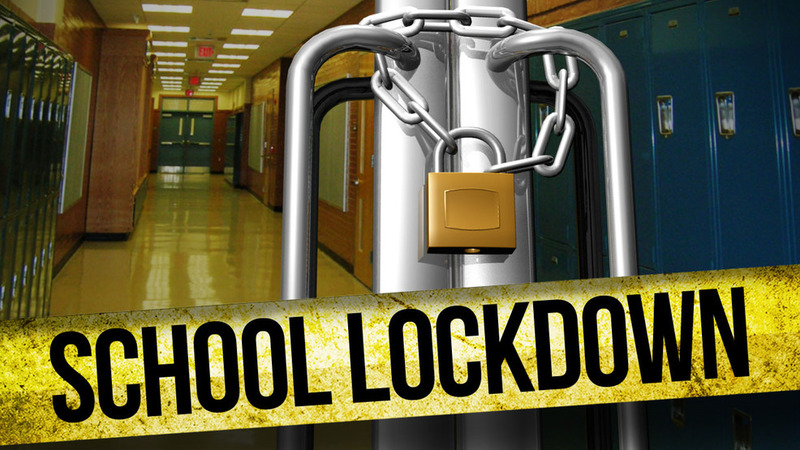 I don’t know how long it was after that, but then the PA announced the lockdown had ended. I came out of the closet. I tried not to look, but for all the sounds I had heard, there was not as much sign of a fight as I thought there would be. Even the blood I had seen in that brief time through the bullet hole had all been removed. I went back to my class, and just told everyone I had hid in a stall in the bathroom. People were impressed with my guts for doing it, but if nobody else had heard that scream, I certainly didn’t want to bring it up. As you might expect, we all went home early that day. Police and EMT were everywhere, but as far as I could see, nobody was being taken away by either. My parents came and were so happy that I was all right. They had been following everything on the news and came as soon as they could. At home that night, I ate dinner, and waited to see what happened on the news. The live coverage had ended a long time ago, but when the news came back on at 10:00, I wanted to see everything. As it started, I saw classes had been canceled for the rest of the week, but then things started to get…weird. The news talked about a student who they refused to name, how he had come to school armed but had been taken into custody after a short firefight. Stranger still, in the footage of the hallway where the scuffle had taken place, the door of the closest which had been my refuge was totally unscathed. Not so much as a scratch on it, let alone bullet holes. It appeared to have been replaced outright, well before any investigation could have been completed. I saw pictures of the student, being led away in cuffs. He didn’t have a mark on him. He wasn’t even wounded as he was pushed into a police car and driven away. All I saw was him fighting and yelling. Even in my glimpses through that bullet hole, I knew that wasn’t the same one I saw. The clothes were completely different. The one I had seen had been wearing a black T-shirt and jeans. The one getting into the police car was wearing a white shirt and shorts. The news said no one had been hurt despite the gunfire. But I knew people had been wounded, even killed. I’d heard them screaming in agony as something vicious had attacked them. And then there was what that chief guy had said. Talking about something being his fault. The institution. That ‘he’ could look like anyone. I don’t know what happened that day for certain. I didn’t see enough, I didn’t hear enough to get the full story. But, this is what I can tell you. I know there was no shooter at our school. I know that someone was arrested that day. Someone who I didn’t know, who I never heard about ever again. That’s right, a “shooter” who never made another day’s worth of news. Just disappeared. When was the last time that ever happened? I know that chief guy and his squads were not cops. I don’t know who they were, but I know cops don’t clean up a crime scene like that. And no human being has ever screamed like that. Ever. But whatever it was that I heard attacking those people, all I know is, it came into that hallway where I was. I was alone, and if it hadn’t been for that janitor’s closet, I wouldn’t have been safe. It could have looked like anyone. Something tells me that squad wouldn’t have helped me either. What was it? How long had it been in our school? Had I ever been alone with it and never knew what it was? Who were those people who had come for it? Where had it come from? And, good God, is it really dead? Hey there, @marcoarment and @OvercastFM, still no word from you guys regarding a fix via email, Twitter, or anywhere, in 2.5 weeks. Any updates? The feed for our most popular podcast is still busted on your service/servers. Please provide an ETA on a fix, thank you! Hey there, @marcoarment and @OvercastFM, still no word from you guys regarding a fix via email, Twitter, or anywhere, in 2.5 weeks. Any updates? The feed for our most popular podcast is still busted on your service/servers. Please provide an ETA on a fix, thanks!